Jackie Kennedy is known for her elegant, tasteful transformation of the White House interiors, but a new cache of papers up for auction offers a rare peek at the nitty gritty aspects of prettying up the presidential digs — as well as the former first lady’s wicked sense of humor. 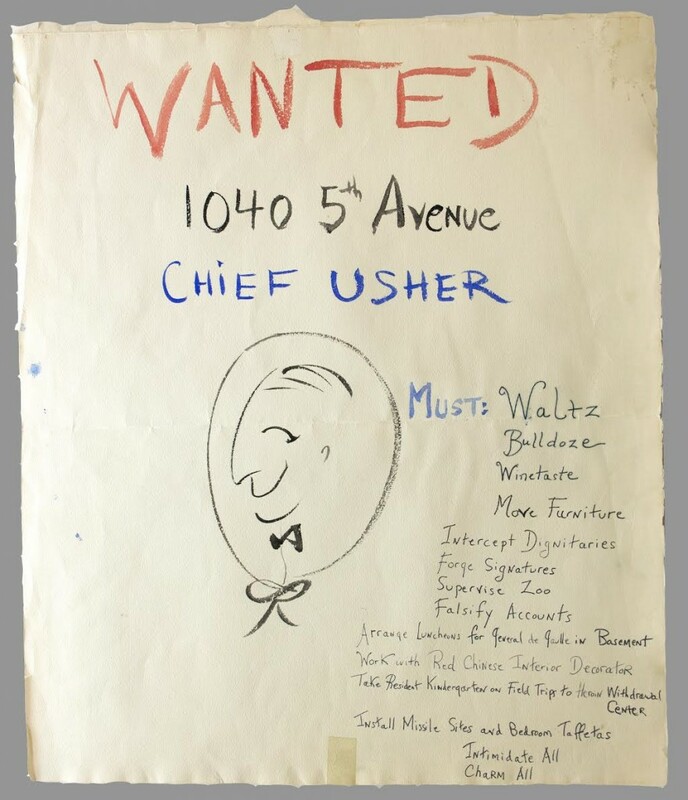 In letters, drawings, and other items being sold by Virginia-based Quinn’s Auction Galleries mostly from the estate of James Bernard West, the Camelot-era White House chief usher who died in 1983, Kennedy shows an attention to the aesthetics of even the humblest working spaces. In one missive, she instructs West to make changes to make the press room look tidier, including possibly adding shelves and trash cans for the sloppy men of the Fourth Estate — though the first lady admitted it was an uphill battle. “That room will never be ideal as they leave their cubbys messy,” she said of the scribes. Letters cover mundane details, from the kinds of trash cans she wants in public areas to the positioning of dog beds and light fixtures, with the occasional flash of the first lady’s gently acerbic wit. In the West Foyer, for example, Kennedy asks West to remove a gold trophy: “it looks like the prize one would give to a lady driving champion,” she writes. And then another task that sounds like some kind of inside joke: “take resident kindergarten on field trip to heroin withdrawal center.” Hmm. Matt Quinn, Executive Vice President of the auction company, says that while there is plenty of Kennedy memorabilia out there, many of the pieces on the auction block offer a rare, intimate look at the storied family. “To find something that’s this personal — it’s an honor,” he says. The auction takes place online and live in Quinn’s in Falls Church on Thursday night. This article was originally featured in the Washington Post on September 9, 2015. Source credit: Emily Heil is the co-author of the Reliable Source and previously helped pen the In the Loop column with Al Kamen. Restaurant Critic Phyllis Richman’s Cookbook Collection Goes to Auction Proceeds from the Aug. 12 sale at Quinn’s Auction House in Falls Church will benefit the Parkinson’s Foundation. Have you ever wondered what a restaurant critic cooks at home? If you head to Quinn’s Auction Galleries in Falls Church on Wednesday, you’ll find a wealth of answers from The Washington Post’s longtime food editor and restaurant reviewer Phyllis Richman. Nearly 200 cookbooks from Richman’s private collection will hit the auction block, including many first editions and signed copies with authors’ inscriptions to the legendary food writer, who recently chronicled her culinary adventures in Arlington for this magazine. The collection heading to auction includes the first-edition volume of The French Menu Cookbook from 1970, and a 1975 edition of The Joy of Cooking. There are also several books on Jewish and kosher cooking, including Jewish Cooking in America by noted cookbook author and journalist Joan Nathan. The sale will also include copies of Richman’s own mystery novels, The Butter Did It and Murder on the Gravy Train, for $10 each. Also on the auction block: several commemorative plates from the many James Beard Foundation dinners Richman attended during her career. Each of the plates, from 1992, 1994, 1996, 1997 and 1998, has a design relating to the theme of that year’s dinner. The preview begins at 10 a.m. this Wednesday, and the auction begins at 6 p.m. Quinn’s Auction Galleries are located at 360 South Washington St. in Falls Church. Proceeds will benefit the Parkinson Foundation of the National Capital Area. This article originally appeared online August 10, 2015 in Arlington Magazine, authored by Jennifer Sergent. Lots of people figured the 54-year-old Gibson Les Paul electric guitar would fetch more than its $20,000 to $30,000 pre-auction estimate, but no one knew how much more. The answer: a lot. Two Saturdays ago, Gil Southworth Jr. paid $140,000 for the guitar I wrote about recently. 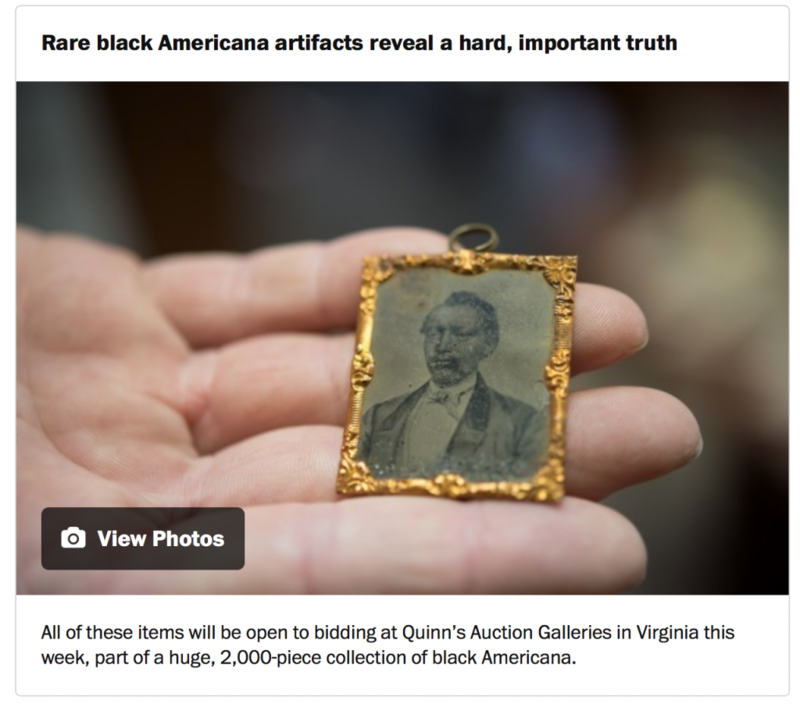 Add in the premium paid to Quinn’s Auction Galleries in Falls Church and the price tag came to $165,200. Why, with that money, Gil could have bought 1,652 brand-new $100 ukuleles (a sobering thought). Gil is from Bethesda. He’s a guitar dealer, owner of Southworth Guitars, which had a shop on MacArthur Boulevard and then Old Georgetown Road before moving to the Web. His customers have included Eric Clapton, George Harrison and Tom Petty. Gil said he was drawn to this one for a couple of reasons. It’s actually painted in “chocolate sunburst” colors, a rarer finish than regular sunburst. More importantly, it’s an exceptionally local guitar: purchased for $320 at Giant Music in Falls Church by a teenage Harry Ryan, played in a Northern Virginia band, and stored for decades under Harry’s bed before he decided to auction it. 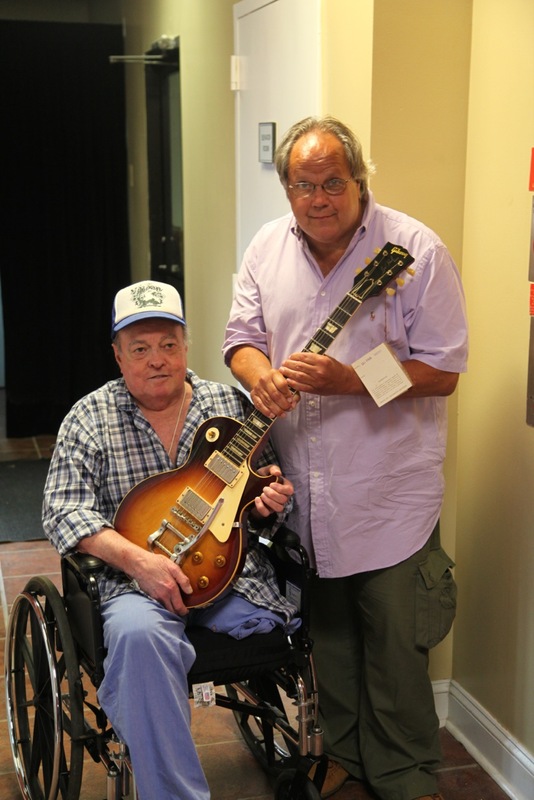 Harry Ryan (left) and Gil Southworth, Jr., with the 1960 Gibson Les Paul Sunburst guitar that Gil had just bought at auction at Quinn’s Auction Galleries in Falls Church, Va., on Sept. 13, 2014. Harry is the guitar’s original owner. It went for $140,000. A self-described “guitar pinhead,” Gil has been getting turned on by vintage musical gear since he was a 10th-grader at Walt Whitman High School in Bethesda. He’d mow the occasional lawn or shovel snow for cash, then peruse the teen swap column in the Evening Star newspaper. One day, Gil noticed that someone was selling a Fender Tremolux head — part of a guitar amplifier — for $50, half of what that typically went for. He bought it, then sold it for $90 — his first transaction. “Oh lawnmower, see you later, man,” Gil said with a laugh. He next bought a 1963 Gibson ES330 for $100 and sold it for $145. Every penny Gil made was reinvested in guitars to flip. He was “a guitar shark” after that. There was a time when vintage guitars went for crazy money, sold to baby boomers flush with cash and eager to emulate their rock-and-roll heroes. Mint condition Les Paul Sunbursts were fetching close to $400,000. Then in 2007, the bottom fell out of the market. “Everybody was so heartbroken,” Gil said. Not him. Gil has a coincidental connection to the Les Paul’s previous owner. His mother, Dorothy, and sister, Barbara, both worked at the Army Map Service, where Harry Ryan worked. Gil’s new purchase has a few issues. The original pickups were removed, and the frets are worn down. Gil will fix that. In the manner of an art restorer, he will take fret wires from a 1959 or 1960 Gibson Melody Maker guitar — he owns about 45 — and transplant them to the Les Paul. And he owns guitars equipped with the desirable “Patent Applied For” humbucking pickups that were originally in the Les Paul but were swapped out years ago. When he’s done all that, the guitar will sing again.